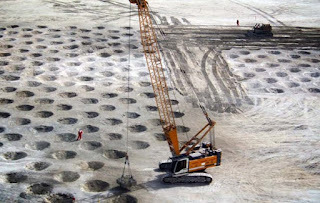 The civil engineering projects are the main significance of a developed country.To fulfill all the project , grounds are required with their heavy bearing capacity.But in our INDIA it is a problem to find out good soil for civil engineering Works everywhere.So the knowledge of ground improvement techniques is the most important to the civil engineers. 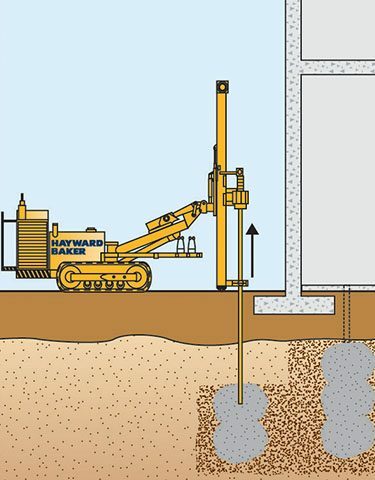 It is the oldest and simplest soil improvement method.This strategy is to just uncover the inadmissible soil and supplant them with compacted fill.This is a typical method to remediate issues with collapsible soils. Evacuation and substitution is by and large reasonable just over the ground water table. It is especially useful in soft clayey and silty soils because the static weight of the fill causes them to consolidate, thus improving both settlement and strength properties. 1. The method has a long track record of success. 2. Any grading contractor can perform the work. 3. The cost is comparatively low, so long as soil for preloading is readily available. The strength and stiffness of the soil is higher when the particles are packed in a dense configuration.This is most effective for improving soil characteristics. stone columns are used to increase the shear strength beneath structures . The method consists of forming vertical holes in ground which are filled with compacted crushed stone, gravel and sand or a mixture. Jet grouting uses a special pipe equipped with horizontal jets that inject grout into the soil at high pressure.Teesta dam is the example of get grouting. Geotextiles are porous fabrics manufactured products and others such as polyester ,poly-ethylene, polypropylene and poly vinyl chloride, nylon, fiber glass and various mixtures of these. 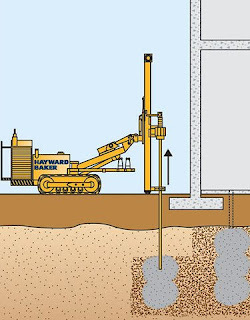 The electro osmosis process can be used to increase the shear strength and reduce the compressibility of soft clayey and silty soils beneath foundation, electro osmosis with or without electrochemical hardening can be considered only for special situations where the alternative of piling cannot be adopted. Mainly soil improvement techniques can be divided in to four broad categories. 1 Densification methods hand-off on propensity of granular soils to densify when subjected to vibrations. Anyway there is a plausibility of harming neighboring structures and pipelines because of use of this strategy. 2.Reinforcement techniques introduce discrete inclusions that stiffen and strengthen a soil deposit. 3.Grouting techniques involve the injection of cementicious materials into the voids of the soil or into fractures of the soil. 4. Now a days, geotextiles are extensively used for improving the soil conditions. These has multiple applications as they act as filters, reinforcement, separations..etc.